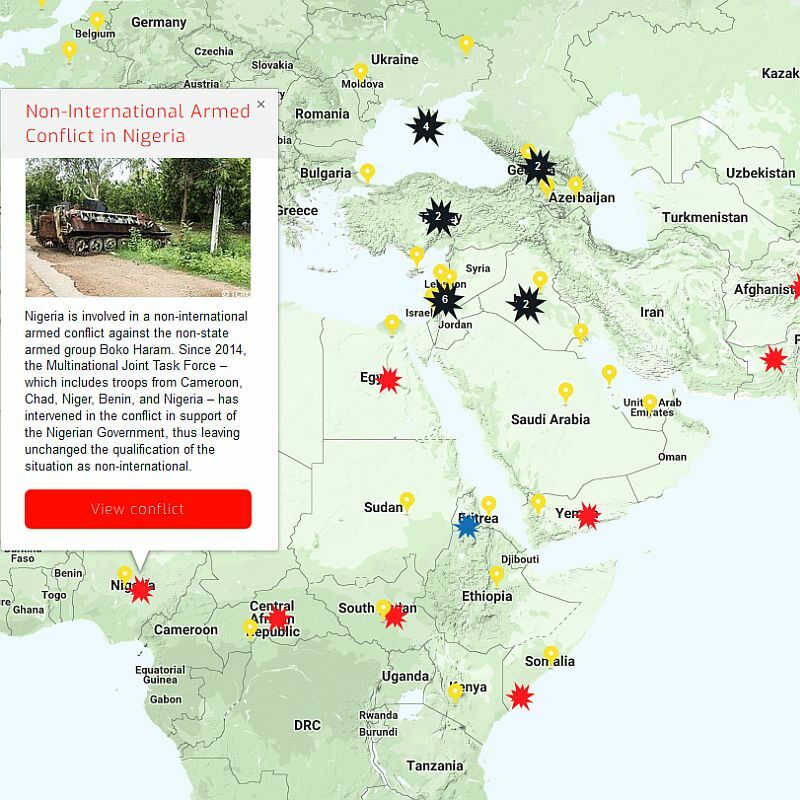 Our Rule of Law in Armed Conflict (RULAC) online portal provides a detailed analysis and legal classification of the non-international armed conflict (NIAC) between Nigeria and Boko Haram, a non-state armed group that pledged allegiance to the Islamic State group. igeria is involved since July 2009 in a non-international armed conflict (NIAC) against Boko Haram, a non-state armed group that pledged allegiance to the Islamic State group. Our Rule of Law in Armed Conflict (RULAC) online portal provides a detailed analysis and legal classification of this NIAC, as well as information about parties to this conflict and recent developments. ‘We use two criteria to assess whether a situation of armed violence amounts to a NIAC under international humanitarian law: the level of armed violence must reach a certain degree of intensity that goes beyond internal disturbances and tensions, and at least one side to the conflict must be a non-state armed group that exhibits a certain level of organization’ explains Dr Chiara Redaelli, Research Fellow at the Geneva Academy. ‘In the case of Nigeria, we considered that both criteria are met’ she adds. Since January 2015, the Multinational Joint Task Force (MNJTF) has been supporting the Nigerian Government in the fight against Boko Haram. The MNJTF is composed of units from countries of the Lake Chad Basin, notably Benin, Cameroon, Chad, Niger and Nigeria. It operates under an African Union Peace and Security Council mandate and is supported by the United Nations Security Council. ‘As the MNJTF has intervened in Nigeria with the consent of the Nigerian Government, its involvement does not affect the classification of the conflict as a NIAC’ explains Dr Chiara Redaelli. ‘Similarly, the splitting of Boko Haram into various factions did not affect our classification of the conflict as a single NIAC’ stresses Dr Chiara Readelli. ‘While there is no sufficiently clear and reliable information on Boko Haram’s factions to conclude that it can still be considered as one armed group, arguably the conflict remains a single NIAC due to the absence of fighting between Boko Haram’s factions and their common perceived adversary’ she adds. RULAC is supported by a law clinic at the Human Rights Centre at the University of Essex. In accordance with the RULAC methodology, a team of Essex postgraduate students drafted the conflict entry on the NIAC in Nigeria, which was then revised and complemented by the Geneva Academy.